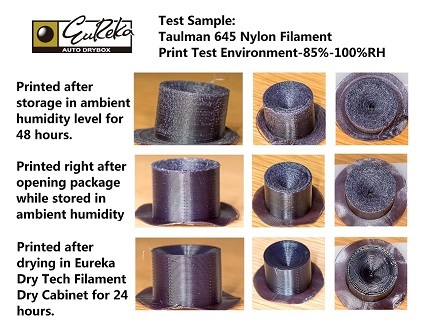 Most may not realize, moisture absorption in filaments could be a significant cause of failure in 3D printing. Eureka Dry Tech’s Auto Dry Box is the perfect moisture control solution for filament storage. Our automatic humidity control cabinets will provide a quick and simple way to store filament without hassle. Simply set the desired humidity level, store the filaments and our dehumidifier will take care of the rest. Your filament will stay completely dry, easily accessible, perfectly identifiable (i.e. no need to open every box to find the right kind of filament you are looking for) and ready to be used anytime you need them for a print. Four filament feed ports allows direct printing from the cabinet while in dry storage. Adjustable hanging rod hanging up to 33 cm diameter spools. Air tight cabinet prevents moisture and dust. Low energy consumption (13 W Avg., 100 W Max). No consumable parts, desiccants to replace, no water tanks to empty. Dries your filament without heat to weaken filament tensile strength. 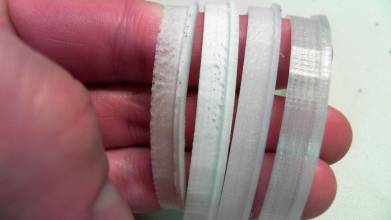 Filament polymers are known to absorb moisture and will affect the quality of your print. Whether you use Nylon, PVA, PETT, PLA, PC or ABS or other exotic material filaments, keeping these filaments dry in a humidity controlled "dry filament storage" is one main element to a beautiful & successful print. Water molecule’s boiling point is approximately 100 °C. Depending on the type of filament material, the extrusion temperature ranges from 160 °C to 250 °C. So any presence of moisture in the filaments will contribute to print failure when the moisture becomes steam and bubbles, causing interference with the flow of plastic out of the hot end while creating unwanted pockets within the finished object. Some filament materials (like nylon, and PVA) are more hygroscopic than others, which means it has an inherent quality to attract ambient moisture. If filament spools are exposed to ambient humidity for long periods of time without any storage solution in place, moisture related problems will soon appear during printing. A complicated project could take hours or even days to complete. When a project has been set to run on its own, discovery of problems are often too late. Moisture absorbed in the filament could cause obstructions to the printer’s hot end and may require it to be replaced. Furthermore, moisture absorption can also affect the tensile strength of the filaments and the output objects. When moisture contaminated filament is passed through the hot end, the absorbed moisture turns into steam and will cause streaks, bubbles, and even brittleness. Eureka Dry Tech is a fully equipped cabinet manufacturer capable of building custom cabinets to your specification. Cabinet designs elements can include storage of your printer & filament while incorporating dehumidifying, heating & air venting functions. Contact us today with your specifications and we will provide a custom built storage solution to meet your needs. OEM and group buys are welcome. For more information regarding Eureka Dry Tech's Filament Dry Cabinet or other products & services we offer, please visit our page.